The monastery of Vărzăreşti is dedicated to the Holy Great Martyr Demetrius. 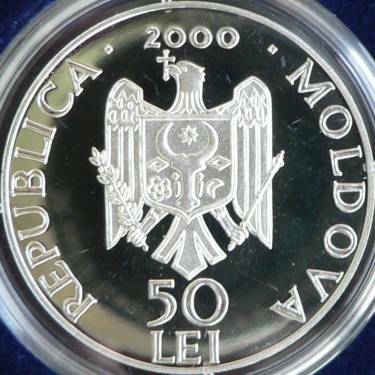 It lies in the commune of Vărzăreşti, the raion of Nisporeni. It is a very old monastery, being atested through a diploma of Alexander the Good in 1420. Until 1815 it was a monk monastery, after that the nuns of the monastery of Cosăuţi took over. Closed in the 60's of the last century by Soviet communists, it was reopened in 1992. 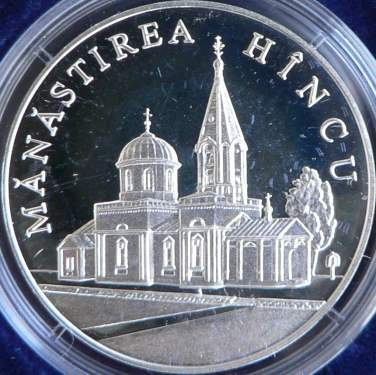 Represented on the coin is the monastery church. The nun monastery Hîncu in the village of Bursuc in the raion of Nisporeni (former county of Ungheni) was founded by the great stolnic (seneschal) Mihail Hîncu. He erected in 1678 a small wooden church, and his sister took the veil here, under the name of Parascheva. The founder donated the estate of Secăreni to the hermitage. In 1836 the hermitage was transformed into a monastery. The monastery has two stone churches. 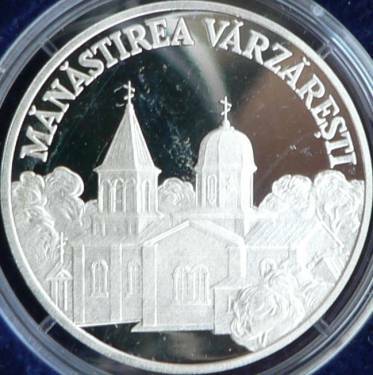 The one dedicated to Saint Parascheva was built in 1835 and repaired in 1996, being represented on the coin. The church of the Dormition was constructed in 1844 and was repaired in 1993. Between 1956 and 1990 the monastery was closed.